The new TC-20E II has now been updated to match with the new AF-S lenses, and will maintain full metering and focusing with compatible cameras and lenses. 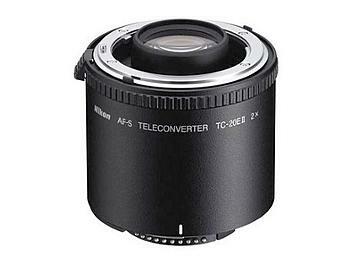 This converter will increase the focal length of the lens by 2x (100%), and reduces the lens aperture by two f/stops. Autofocusing only possible when used with D1, D1X, D1H, D100, F5, F100, N90s, N80, N75 and N65 AF SLR cameras, or any newer models. Only limited AF with AF-S 500mm f/4D ED-IF (II) and AF-S 600mm f/4D ED-IF (II).